This coastline enjoys a gentle climate, brilliant sunshine and protection by high mountains from the cold winter wind. Set on the southern shore of Spain's mainland the average temperature along the Costa del Sol is 18°C. In winter it never freezes and seldom drops below IO°C and in summer reaches 30°C, but with refreshing sea breezes cooling the atmosphere on very hot days. With only about 30 days' rainfall per annum, it is an ideal climate for the active and those who prefer to lie in the sun. South Spain has been deeply involved with many civilisations and many famous historical sites remain. Ancient towns have been settled by most of the Mediterranean peoples over the centuries, leaving a mixture of Christian and Moslem cultures. It has a coastline fringed with mountains and beautiful valleys, unspoilt villages and miles of natural beaches stretching from Malaga to Gibraltar and Cadiz. The land rises sharply from the sea to the mountains giving a perfect setting for the development of properties with wonderful views. Mijas is so picturesque that it has produced an excessive surge of excursions. A visit nevertheless is worthwhile. The setting is typical rural Andalusia - the impeccably whitewashed little streets, the small squares perfectly suited to the village and the two modest Mudéjar-style churches. Numerous sports facilities are available including tennis, cycling, golf and a wide range of water sports. There is also an aqua park 'Aqualand' in Mijas along with a large selection of fine restaurants and an open air theatre which hosts many cultural events during the summer months. One way to enjoy viewing Mijas is by taking a ride in the popular "donkey taxis". 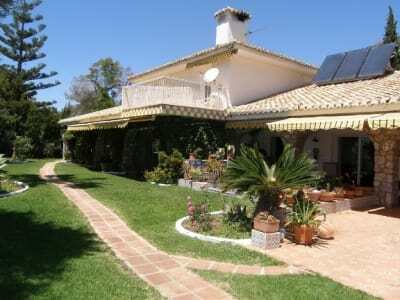 Superb and spacious south facing 3 bedroom villa plus a 1 bedroom guest apartment, both of which have lovely sea views. 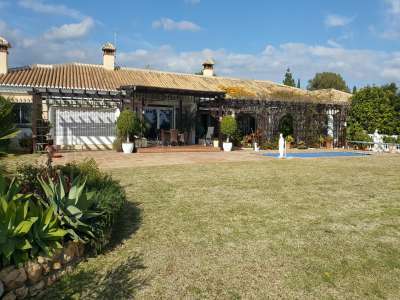 Located very close to the beach and El Chaparral Golf Course in Mijas Costa.